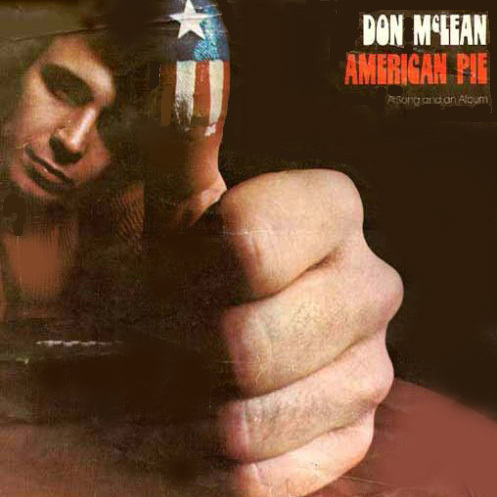 Desert Island Singles (Tag-Team Edition): “American Pie” by Don McLean (1971) | Name-Brand Ketchup. Scott: I wrote a term paper about the song “American Pie” in grade 10. Alan: I know enough about that song that, if you had asked, I could have co-authored that term paper with you. Scott: “American Pie” is quite likely the most analyzed American pop song in history. It’s also the lengthiest song ever to hit #1 on the charts. When United Artists issued it on a 45 rpm single, they halved it between sides one and two. Top 40 radio stations in Minnesota played only the first side on the air until listeners demanded they play the album cut. Alan: The song announced itself from the start as musical truth: in both its edited and long play forms, nothing less than a bible of sorts. It blared over and over from speakers, connected to radios tuned in to stations chronicling the sounds of the times, in the relatively new days of 1971 and through the beginning days of 1972. In the bustling five boroughs of New York City and the city’s equally alive surrounding areas like Long Island, where I lived, listeners were transformed by a better-than-eight-minute opus that didn’t so much as make an impact as revise the meaning of the word. “American Pie” rewrote the book of love: it didn’t simply write it, as the lyrics ask plaintively. The song summed up the feelings of a generation of music lovers, some of whom didn’t immediately feel the sock and pow of change because they hadn’t lived long enough past what McLean called “the day the music died” to come to their own realizations. They needed the song to do that for them. That famous day which silenced the voices of Buddy Holly, Ritchie Valens, and J.P. Richardson (the Big Bopper) occurred in 1959, only a dozen years earlier. Scott: It’s interesting to note the spin that’s been applied to “American Pie” over time. Well-known media wackjob Glenn Beck spouted off on the radio last year that it’s a metaphor for the sorry, sorry shape of liberal America. (You didn’t really expect anything different from Glenn, did you?) I think it’s a metaphor, too, but not for the impending decline of the American way of life. Rather, I think it’s a description of how rock music has rallied, regrouped, and reinvented itself over the years, staying relevant and meaningful to younger and younger fans even as its imminent demise was forecast again and again. Alan: “American Pie” instantly became the “it” song of the moment. If it wasn’t blaring out of radio speakers, both stationary and portable, it was being played and sung at parties and genial get-togethers by both barely-capable and virtuoso acoustic guitar players. Mostly by accident, as it turned out, it became as vital a sung treatise and learning experience as Arlo Guthrie’s “Alice’s Restaurant” was in 1967, and that song was 18 minutes long. If you were going to party like it was 1971 you had to know the lyrics to both songs because they were relevant to your generation: and, well, because it made others think you were cool because you knew all the words and all the chords. This was no three-minute pop song.